Click the "A" to add lies of text. Click and drag text to position. SKU: PREMIUM NAME PINS-02. Category: Custom Name Pins. 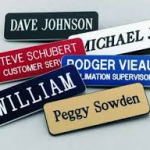 Our premium plastic name pins measure 1.5 inch by 3 inch and are available with pin back or magnetic backings. 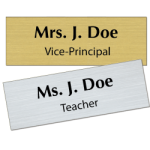 Our premium name pins can be customized with your logo using our product designer. Our premium plastic name pins are engraved using a 2-ply plastic. Select from our color and backing options and then design your name pin. If our online options do not support your needs, please contact us at 409-886-1363.